About 10 more people had charges related to their activities during protests of US President Donald Trump’s inauguration dropped Thursday after it was revealed that the US Attorney’s Office, under the Department of Justice, intentionally withheld mountains of evidence from the defense, a constitutional violation. Initially, prosecutors used a secretly recorded video from right-wing media organization Project Veritas to help sustain their case. That video was given to Detective Greggory Pemberton of Washington, DC's Metropolitan Police Department (MPD), whose sole job has been to review evidence related to January 20, 2017, (J20) protests since the case began, Pemberton said under oath during the first round of trials in December. Pemberton has been working literally within eyesight of US Attorney Jennifer Kerkhoff, who is leading the prosecution, since the cases opened after the arrests on January 20th. Last week, prosecutors admitted that they had failed to present the defense with an additional 55-minute video from Project Veritas and that they misrepresented potentially exculpatory evidence after they claimed that the initial video had been edited to remove its ending. They were provided with that video by Project Veritas. Friday, it was revealed that the government had concealed a whopping 69 separate recordings, including 66 videos and three audio recordings, that were taken of meetings planning some of the many demonstrations held across the nation's capital during Trump's inauguration. It also came to light that Project Veritas, which has been embroiled in a number of controversies over the years for its deceptive editing practices, had also met with the FBI regarding the J20 protests. Nonetheless, the District of Columbia Attorney General's Office filed a response Thursday to a complaint filed by Mara Verheyden-Hilliard of the Partnership for Civil Justice Fund in which they denied accusations that the MPD had received information from Project Veritas. That lawsuit, like the ongoing J20 trials, is being deliberated over in the Superior Court of Washington, DC. "Their response, remarkably on the same day that the US Attorney's Office is having to drop charges for prosecutorial misconduct, actually denies that the MPD and its officers worked with and received information from Project Veritas and the Oathkeepers," Verheyden-Hilliard told Sputnik News. "We filed a complaint and the complaint has a number of paragraphs where we detail each of the allegations against the District, and then the District has filed a response with similarly numbered paragraphs where it admits or denies the allegations or claims it doesn't have sufficient knowledge. And, incredibly, it actually denied the paragraph that we wrote that says the DC MPD and its officers have worked with and received information from private, politically motivated right-wing organizations, including Project Veritas and Oathkeepers," Verheyden-Hilliard said. "They just denied the paragraph. We also said that the materials provided by the organizations to the MPD have been used to prosecute persons whose political views are in apparent opposition to the political goals of the providing entities, and they say that they don't have sufficient information to admit or deny." "I mean, it's in court, they've used the videos, the videos have been used to prosecute people and they're claiming that they don't know whether the videos have been used to prosecute people," she said. As for what accounts for the disparity between the two developments Friday, Verheyden-Hilliard says that it could be an attempt to shield police from the consequences of their misconduct. "I think when it comes to the District of Columbia's Attorney General's Office, we've routinely seen a ‘say anything' response and robust defense of the police department regardless of the level of police misconduct." On January 20, 2017, protesters marched through Washington, DC, as Trump was sworn into the Oval Office. A number of demonstrations took place throughout the city that day, but an "anti-capitalist" protest captured the nation's attention when 234 people were arrested en masse after some property was destroyed by a small number of individuals. Almost all of the people arrested were initially charged with felony rioting. A superseding indictment filed 10 days later brought a host of new charges against the defendants, including conspiracy, which in conjunction with other charges meant that defendants could face 60 years behind bars. Some of those charges have since been dropped, though total possible punishments for individuals still reach 50 years. Defendants are being tried in groups. The first group was found not guilty on all charges in December 2017 and shortly afterwards the US Attorney's Office dropped charges against an additional 129 defendants. After Thursday's dismissal of charges, some 50 demonstrators remain to be tried. Sputnik News spoke with Chip Gibbons, legislative counsel at Defending Rights & Dissent, who has been following the case and was in court to witness the dismissal of charges against 10 people Thursday. "It was two trial groups today," who had charges dropped, Gibbons told Sputnik: the groups whose trials began May 29 and the group whose trials were to begin June 4. The June 4 group "had all of their charges dismissed," Gibbons said. "Of the May 29 people, one of them had all of their charges dismissed and then three of them now are only facing three misdemeanors and a bench trial. The prosecution voluntarily dismissed the incitement [to riot] charge against all of the defendants in these groups, and then the judge threw out the conspiracy charge against the remaining three. And for all 10 defendants, the conspiracy charge was dismissed with prejudice." ​When a defendant's charge is dismissed "without prejudice," it means that a determination has not been made as to whether they are guilty or innocent, but that the government is not interested in prosecuting them at that time. They may reopen those charges at a later time. The June 4 trial group contained the alleged organizers of the demonstration. Sputnik News spoke with one of the defendants of that group, Dylan Petrohilos, prior to the dropping of the charges against him. "What I think the cases end up representing is suppression of dissent in the United States. We're seeing waves of felony charges, not just here, but in Michigan, in St Louis and in Washington, DC," Petrohilos told Sputnik. "What we're seeing is anti-fascist protesters — and Black Lives Matter protesters as well — facing the brunt of political repression in the United States. Meanwhile neo-Nazis are openly calling for violence and have acted on that violence, specifically in Charlottesville." "The people who are alleged to have organized it didn't come into play in any of the other conspiracy trials either, and the prosecution today said the conspiracy started at Logan Circle, so you don't have to have been at the planning meeting to be a part of the conspiracy," Gibbons said. "The prosecution says they entered into the conspiracy at Logan Circle." Logan Circle served as the meeting place for the anti-capitalist march. Gibbons said that the prosecutor's reasoning that the conspiracy began there is "baffling." Prosecutors have also used defendants' black attire, masks, medical equipment and legal activist forms to also argue in favor of a conspiracy. The conspiracy charge is significant because "with conspiracy, you're guilty for everything the other parties to the conspiracy do in furtherance of it, so once you have a conspiracy charge it's very easy to prove other things because you just have to prove other people did it in furtherance of the conspiracy," Gibbons said. "The remaining charges were dismissed without prejudice," Gibbons said. "The prosecution wanted to dismiss the charges without prejudice; defense wanted all of the charges dismissed with prejudice; judge dismissed some with prejudice and some without, which is extremely confusing." The four people who have been on trial since May 14 were not affected by today's ruling, as the judge in their case, Judge Kimberley Knowles, decided not to sanction the prosecution for withholding the evidence, which is referred to as a "Brady violation." "In the other trial, Judge Knowles found there was a Brady Violation but it wasn't intentional," Gibbons said. As such, "with the people on trial, with closing arguments going on today, none of this applies to them and the same arguments remain in their trial." It's unclear how the development will affect upcoming trials. "It's going to be impossible for them not to be marred by this," Gibbons said. "The conspiracy charge was only dismissed as a sanction for withholding evidence. It's a punishment. So, I don't know who is going to hear motion hearings for the other trials, like the ones in October. I don't know if they'll get the same results." "For starters, part of the problem with the Brady Violation is the defense doesn't have time to investigate or prepare it. But all of this has been disclosed now and the other trials aren't until October, so theoretically you could see the judge being like, ‘You had time to investigate this now,' but also there is the issue that they did commit a very serious constitutional violation and Judge Robert Morin said it was intentional. He refused to rule whether it was malevolent or not but he basically said [US Attorney Jennifer] Kerkhoff lied to him." Gibbons says that the judge would not make that ruling because Kerkhoff was not there to defend herself. "She was downstairs railroading other people." Morin "repeatedly stated that the government made a representation to him that was not true and he asked them why they did that and the only thing they could say was ‘we weren't there, that was Jennifer Kerkhoff,' and he was clearly very upset that Jennifer Kerkhoff had told him he Detective Pemberton had received one recording from Project Veritas when in fact he received 69 other recordings as well." Gibbons suggested that the prosecution's eagerness to drop the charges Friday indicated that something strange was afoot, although he wasn't sure what. "The US Attorney's Office came in and asked to dismiss these cases without prejudice, and the defense is the one who objected to that. The judge was like, ‘Everybody can go home now,' and they're like ‘No, we object, we want them dismissed with prejudice,' and it was very clear that the prosecution didn't want a ruling on Brady sanctions, that's why they dismissed them," Gibbons said. The prosecution made the argument that the judge could not hold a hearing on Brady-related sanctions because the cases were dismissed. "And the judge was like, ‘No, the cases haven't been dismissed, a motion to dismiss them has been filed but I haven't ruled on them,' which I feel like the prosecution should get. Like really, you don't understand motions?" Gibbons wondered. "It's really interesting because the reason they cited for dropping the charges was that the Project Veritas issue was a distraction and the trial had become an investigation into them," Gibbons said. "So it's like, ‘you're dropping the charges to protect Project Veritas?' From the prosecution's side, what they're doing doesn't make sense." DISCLOSURE: I was arrested while covering the anti-capitalist march on January 20, 2017. My felony rioting charge, which carried a 10 year sentence, was dropped prior to the superseding indictment, and was sealed based on a ruling of my actual innocence on November 21, 2017. 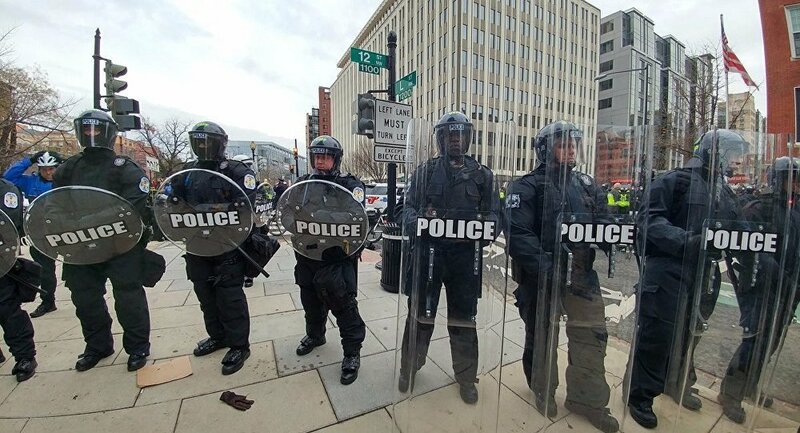 129 J20 Cases Dropped; Government to Shut-Down, Who Will Be Blamed?